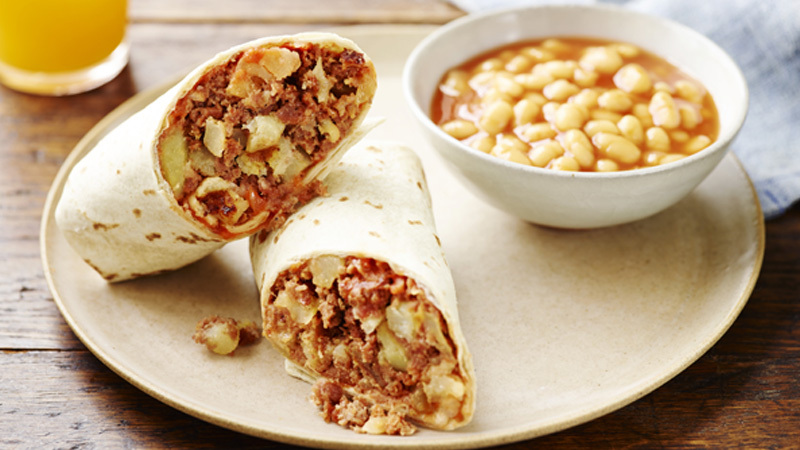 Wrap up a classic corned beef hash in warmed flour tortillas for a filling breakfast or brunch! 1. Heat the oil in a large non-stick frying pan over a medium heat and fry the onion for 5 minutes until softened. Add the diced potatoes and cook over a medium heat for 15 minutes, stirring occasionally. 2. Add the diced corned beef. Cover and cook over a low heat for a further 15-20 minutes, stirring occasionally, until the potatoes are tender and the mixture is crispy in places. Season to taste with salt and freshly ground black pepper. 3. Warm the tortillas as directed on the packaging. 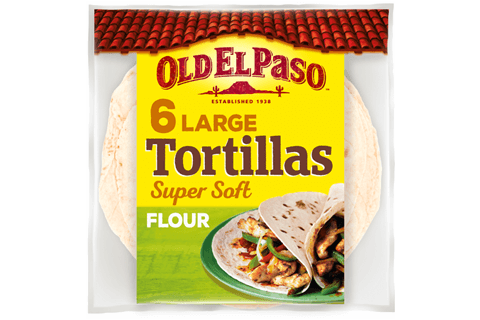 Place 1 tortilla on a chopping board and spread with 1 tablespoon of the salsa. Top with 1/4 of the corned beef hash mixture. 4. Fold in the sides towards the centre then roll up tightly to completely enclose the filling. Repeat with the remaining ingredients to make 4 burritos in total. Serve, halved, with baked beans on the side. Look out for packs of ready-to-roast potatoes in the prepared vegetables section of the supermarket. If unavailable, use defrosted frozen ready-to-roast potatoes, finely diced or grated. Stir in some finely chopped and drained Old El Paso™ Sliced Red Jalapeños to the hash mixture for an extra spicy hit.